The Women Development Centre celebrated the women’s day on 14 March 2014. A guest lecture was arranged on “Women in Entrepreneurship”. The resource person was Ms. Sangeetha Peter, Managing Director, Lifespring Healthplus India Pvt Ltd, Coimbatore. Her inspiring message motivated the students into entrepreneurship. She also quoted the words “Begin doing what you want to do now. We are not living in eternity. We have only this moment, sparkling like a star in our hand - and melting like a snowflake” by Marie Beyon Ray. A debate was organized on “Women in Democracy”. It was moderated by Ms.Pamela Suresh, Principal, Vasan Institute of Ophthalmology, Coimbatore. The student participants were the first year BE, ME, MBA and MCA students. The Women Empowerment Cell was constituted on 22.05.2013 at Sri Ramakrishna Institute of Technology. It has been formed with a co-ordinator and 4 members. A Toll-Free number and dress code were formulated. The students were asked to strictly adhere to the dress codes. The Legacy Literacy Club was inaugurated on 21.09.2011. The function was presided over by Thiru. G. Chockalingam, Chairman / Principal District Judge, District Legal Services Authority, Coimbatore. In his address to the students he said, every person should abide to the law to have an organized and a peaceful life. Ragging is an offense which is punishable. He advised the students not to indulge in such acts. He also advised the students to have a good relationship with other students and also with the society. The function was felicitated by Sri.C.Soundara Raj, Managing Trustee, S.N.R Sons Charitable Trust, Thiru. N.Seshasayee, Additional District Judge, Coimbatore, Thiru. M. Thangaraju, Judge, Family Court, Coimbatore. Thiru A. K.A Rahman, Judge, Coimbatore. Thiru.M.Sreenivasan, Chief Judicial Magistrate, Coimbatore and by Thiru. L.S.Sathyamurthy , Judicial Magistrate No.1, Coimbatore. 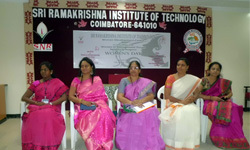 The women Development Centre at Sri Ramakrishna Institute of Technology was constituted on 19.10.2010. The Legal Aid Club inaugurated in the college on National Legal Services Day is very beneficial for all the girl students says Ms. R. Nagalakshmi of second year ECE. She also added “Women in every walk of life need Legal Literacy”. This awareness will enable the students to learn the sense of rights and duties. The students were also exposed to Tamil Nadu Harassment Act Domestic Violation Act and Indian Penal Code. The girl students also pledged not to support or indulge in dowry demands and discrimination between children.